March and spring is just around the corner, along with is the start of the GGLC Autocross season. It will be club members only for the first week. Non-members after that. Same format as we ran last year- mid 60’s max on the driver count and 10 or more runs for the day. Silicon Valley Auto Group (Lotus of Los Gatos) is back as our sponsor. They will be providing their usual bag of goodies over the course of the season. April 26, will be more of a pure clinic. Great for family and friends who are new to autocross. Also for those of us that want to work off some rust or get some coaching. Driver count will max out in the mid 30 range. May 16, June 27, July 18, Aug. 30, Sept. 19 and Oct 17 will be points events for club members. Same classes and format as last year. We’ll score the best 4 of 6 events. This season, we’ve got “official” numbers decals. If you’re interested in picking up a set, please visit Chuforia Graffix. Make sure your profile is up to date on motorsportreg. The club will be picking up a software package to handle the bulk of the scoring duties. In particular we’ll need to have your car details correct. Assistance: putting on a autocross, is very much a volunteer effort. There are a couple of area, that we’d like a pool of helpers to cover. Two or three to get the equipment set up. Four or five to help set up the course. We will need you to be on site 7:15- 7:30, to get started. Question: Which Formula 1 car has been raced by no less than 4 World Champions? 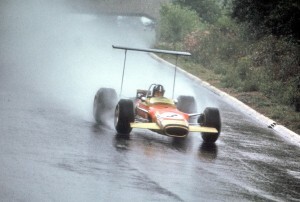 Answer: The Lotus Type 49. More specifically the Lotus Type 49 Chassis R5/R10 which was raced by Graham Hill, Jochen Rindt, Emerson Fittipaldi and Mario Andretti. 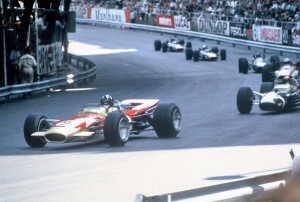 Originally introduced in 1968, the R5/R10 chassis took Graham Hill to his 1968 Championship as well as victories in the ’68 and ’69 Monaco Grand Prix. Click through to read the full history of a very special Lotus. Today is the 80th anniversary of the birth of Graham Hill (February 15, 1929 – November 29, 1975), a two time Formula 1 World Champion and the only man to win the Triple Crown of Motorsport. He drove for Team Lotus for three seasons including the 1968 season where he pulled the team around him to win the championship after the untimely death of Jim Clark. He was also the father of the 1996 F1 World Champion Damon Hill. Check out this great video of Gavan Kershaw (Executive Engineer, Chassis Department) describing a lap of the Hethel track in a Lotus 211. And once you’ve seen that watch the full-on flying lap below. Format will be heats competition – practice, heat races, semi finals, top 10 to the finals. We’ll score the best 2 of 3 events and award medals and prizes to the top 3 and a random drawing (club members only). Be sure to give LeMans a call, if your plan on attending. Club members, guests or fellow Lotus owners are welcome. Cost $50, per event. Additional $5 for pizza and soda. Arrive at 11am for check in, lunch, first karts out by 12:30. Call LeMans Karting to reserve a spot(s). January’s meeting at Tom and Cherie Carney’s home has been a tradition in the GG Lotus Club as long as most of us can recall. It is one that many of us anticipate all year long. This year’s event was long on tradition and one big surprise. It was easy to find the Carneys’ address on Palm Drive in Burlingame. Drivers could see it from three blocks away because it was still lit with Christmas decorations that served as a beacon to the festivities. The ornament-bangled, major-fire-hazard that stood in the front window was, yet, another element of the charm and tradition that we have come to love and expect. Then there’s the food. Cherie, a splendid cook, has catered professionally, and again this year she offered a astounding array of delicious treats including ribs, shrimp, dips, cheeses, deli-meats, breads, salad, a mountain of seven-layer dip and brownies for dessert. Seriously, there was an insane amount of food available for the grazing guests, and no one left hungry! For entertainment there was drag racing in Tom’s (new, mega) garage that now features an hydraulic hoist. Throughout the evening, there were at least a dozen spirited discussions at any given time ranging from tall tales and dirty jokes to useful, technical help. Meanwhile, many of the ladies gathered in the kitchen to commiserate. The meeting was led by our newly elected officers Rob Deitsch (and First Lady Jennifer) and VP Dave Ellis. Another successful (traditional) Toy Rally was reported, and a drama-free, Laguna Seca track day took place under clear skies and a relatively dry track on December 26th. 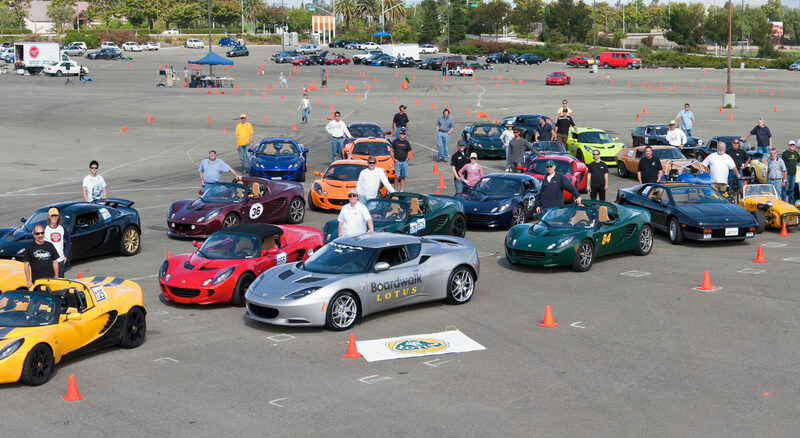 There was talk of the new Evora, the LA Auto Show and the 2009 West Coast Lotus Meet. The event this year will be especially significant in that LCU wishes to launch their latest model to the West Coast at our event. It will likely take place in September. Details for time and location will be made shortly. Now, there’s a good reason to block-out your calendar! Rob and Jen offered to host the February meeting at their home, which would be extremely exciting and a GGLC-first if Jen’s pregnancy came to fruition a tad early. The GGLC is soon to expand it membership by one (note: since then, Brandon/Susan stepped up to host the meeting). As the meeting came to a close, an announcement was made as Cherie and long-time member Betty Nester colluded to spring a surprise, Beehive birthday cake on an aging member who reached sixty years on January 15th. Traditions are especially great when they include such excellent friends! Classic & Sports Car Magazine polled a jury of 20 top automotive designers to try and find the most beautiful car of all time. The power packed jury included several folks with strong Lotus connections such as Giorgetto Giugiaro (Esprit), Peter Stevens (Esprit S2), Julian Thompson (S1 Elise) and Steve Crijns (Lotus Design) along with industry stalwarts such as Gordon Murray, Ian Callum and Marcell Gandini. The Citroen DS was declared the eventual winner, but Lotus had not one but two separate entries in the top 10. The original Lotus Elan is possibly one of the most iconic sportscars of all time. It encapsulated what a british roadster was all about and many would say that it is one of the best handling cars to come from Lotus. The ultimate compliment to the Elan was given by Mazda when it bought two of them for the design team that was developing the Mazda Miata. 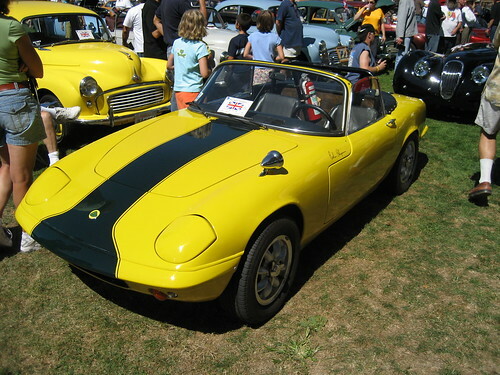 This particular Elan belongs to our own Joel Lipkin and was the “Best Lotus” winner at the 2006 Palo Alto British Car Meet. 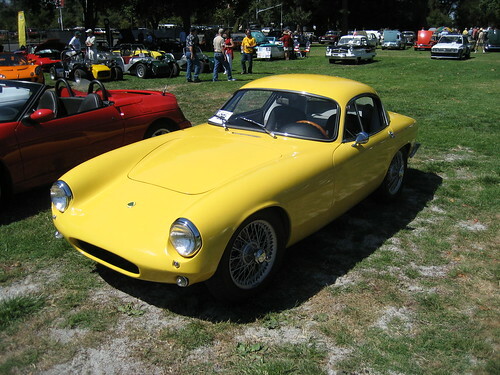 The Lotus Elite was the first production car with a fiberglass monocoque construction. The swoopy shape was styled by Peter Kirwan-Taylor who was actually an accountant by profession. The combination of low weight, good aerodynamics and innovative construction gave the Elite an impressive turn of speed leading to 6 class wins at the 24 Hours of Le Mans including winning the Index of Performance and the Index of Thermal Efficiency. What’s the most beautiful car of all time? A multi-million pound Ferrari or the curvy Jaguar E-type perhaps? No, it is now officially Citroën’s humble DS, the car most famous for saving President De Gaulle from assassination. That was the verdict when Classic & Sports Car magazine polled a jury of the world’s leading car designers to nominate the most gorgeous cars ever. The 20-strong panel ranged from Car designer of the Century Giorgetto Giugiaro – the man behind the Maserati Bora, VW Golf, Fiat Panda and Lotus Esprit – to current Jaguar director of design Ian Callum, and each picked their top three beauties. Although Ferrari secured the most votes as a marque, they were spread across nine different models, leaving the Citroën to scoop the honours as the single most beautiful classic. James Elliott, editor of Classic & Sports Car, said: “The Citroën is a benchmark design, but we were still astonished that it came out on top when you look at the sexiness – and values – of some of its rivals. “Apart from the Mini, it’s by far the most affordable car to get any nominations at all, which probably means it’s a great investment! “It’s great to see the iconic DS getting such recognition amongst such an august group of car designers , and with the amazing news that a new DS range from Citroën will appear over the next few years, it’s clear we have lost none of our styling panache or instinct for innovation,” commented Citroën spokesperson Marc Raven on hearing the news. With its name derived from Déesse (French for Goddess), this innovative design was styled by Italian sculptor Flaminio Bertoni and launched in 1955. The futuristic shape was an instant design classic and over the next 20 years more than 1.5 million cars were sold in a range of specifications. But it wasn’t just the shape that revolutionised automotive design: the complex self-levelling suspension, plus powered steering, clutch and brakes were otherwordly compared to rival cars of the era. While regarded today as a technical masterpiece – and a potential nightmare for the home mechanic – it was of pioneering construction for its day with unitary ‘tub’, bolt on panels and a plastic roof. But the appeal of the DS is as much as a cultural icon as a car with a long list of celebrity owners and fans (Alec Guinness, Peter Cook and Will Self among them), plus regular appearances on film and in design museums and art galleries. Founded in 1982, Classic & Sports Car is the UK’s market-leading classic car magazine and Britain’s third best-selling motoring monthly. The “most beautiful classics” feature coincides with an extensive redesign of the magazine and is accompanied by a free A2 poster featuring Lamborghini Miura and Jaguar E-type, plus the definitive buyers’ guide to the Citroën DS. The Lotus Evora has finally started series production and the folks at Lotus Central were around to document the build process on the initial production examples. 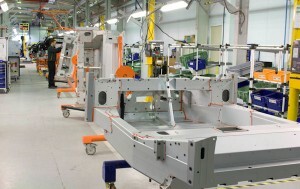 Click through to see how the bare chassis below gets turned into a full production Lotus. One of the highlights of the 2008 West Coast Lotus meet were the time trials that were held at the go-kart track of Jackson County Parks facilities. You often hear that the Lotus handles like a go-kart but this was the first time that I got to drive my Elise on an actual go-kart course. Our run format consisted of running 3 back to back laps on the outside of the track to count as one single timed run. It was an interesting day and we got to to run the first session in the dry before the rain came down creating a very wet second session.The following video combines in-car and external footage of my first wet run of the afternoon. Major thanks to Rob and Jen from Dietsch Werks for taping the run from the outside. Lotus Elise on a Go-Kart track from rnair on Vimeo. Since my R-compound tires were completely slick I had to swap to my AD-07 street tires for the first time in six months. The combination of skinny tires, street compound and wet surface meant that I had no grip and I almost went off while braking for turn 1 (I was later riding with someone who shall not be named when we actually went off at the same spot :-)). I make the turn with about six inches to spare and am pretty cautious and slow waaaay down for turn two only to find the rear end wants to fishtail on the exit. Turn 3 went much better but the lack of front-end bite at turn 4 lead to a few NSFW comments. At this point I slowed down even further and tiptoed my way around the course for the rest of the run. We later found out that the county had repaved about half the track which meant that the course had sections with both old and new asphalt which account for the wide variance in the grip levels at the turns. Turns 1 through 4 had the lowest grip and you had to tiptoe through them before getting on the throttle for the rest of the course. The next video is incar from my final run in the dry. The lap is much better and doesnt have too many mistakes apart from a missed shift on the start of lap 3 – I believe it ended up being the second fastest Lotus time of the morning. West Coast Lotus Meet: Time Trials from rnair on Vimeo. Welcome to the Chapman Report Online, the official blog of the Golden Gate Lotus Club. Through this blog we plan to share with you what we’re up to: club events, track days, autocrosses, drives, etc… We also hope to introduce to some of our members doing the things they love the most. Additionally we will keep you up-to-date with all the latest Lotus news, stories, videos and articles.